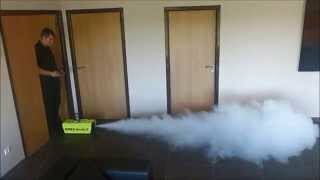 Leader SMOKE fluid creates a slight grease deposit on the walls of the space where the smoke is produced, on the people and on equipment. It is necessary to ventilate the space after use. Leader SMOKE fluid is environmentally safe. Leader SMOKE fluid has a long suspension time. In fact, the suspension time is 30% longer than other fluids available on the market! Adjustable smoke density, from very light to very dense. Leader SMOKE fluid is perfect if you are looking for a very dense, realistic, ecological and safe smoke. It is also a more economical smoke to use because of its long suspension time. Its suspension time is 30% longer than other fluids available on the market! It is ideal for small (about 100 m³) and large (about 2000 m³) volumes. It is also available in 4 x 5-litre drums.